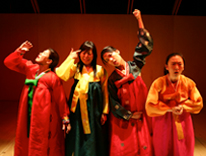 The UCLA Asian American Studies Center will present a talk by Karen Shimakawa of New York University entitled “Young Jean Lee: Performance and Ugly Feelings” on Monday, May 19, at 12 p.m. at Public Affairs Room 1246 on the UCLA campus. Playwright Young Jean Lee (www.youngjeanlee.org/), like many American playwrights of her generation, chafe at the thought of writing an “identity” play — something that will genuinely or accurately reveal some truth of a racialized and gendered experience. Her body of work draws upon the exhaustion and anxieties that characterizes recent postfeminism and post-race discourses. Jameson’s lamentations over the waning of affect notwithstanding, Lee’s play set in this post-post landscape is full of feeling — of discomfort, self-loathing, boredom, and mild bemusement. Using Sianne Ngai’s formulation of “ugly feelings,” this talk considers Lee’s work as indicator of, and response to, the generative value of ugly feelings. As an ensemble these works explore the vexed terrain of race and their imbricated constructions of gender and sexuality in the US. They demonstrate the ways in which the negative affect produced around such constructions might nevertheless help us think through not only the material but also the affective registers that attend racial discourse today. This event is co-sponsored by the Office of Faculty Diversity and Development, Center for the Study of Women, Department of Theater, and the Office of Instructional Development. 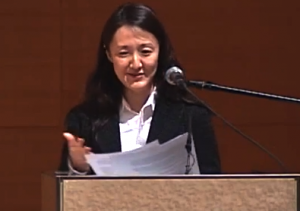 Shimakawa is the chair of performance studies in the Tisch School of the Arts at NYU, and an adjunct instructor in the NYU Law School. Her research and teaching focus on critical race theory and performance. She is the author of “National Abjection: The Asian American Body Onstage” (Duke University Press, 2002) and co-editor of “Orientations: Mapping Studies in the Asian Diaspora” (Duke University Press, 2001).